When designing a kitchen remodel, many consumers are looking for a “greener” option. They are opting out of granite, a traditional go-to, in favour of something that promotes sustainability in their home. Kent and Anna Sherwood of Vancouver, B.C., recently renovated their kitchen counters and decided on a recycled glass material. Their decision is in line with many Canadians who are looking for ways to minimize their impact on the environment by shopping for sustainable products. Like many homeowners, the Sherwoods shopped around for typical granite countertops – but nothing struck their fancy. They even considered that maybe the “granite fad” had run its course, leaving them unsure as to how to proceed. They observed a range of options in order to come to a decision that was best for them. Like granite, cleaning and maintenance is required to prevent dark materials (sauces, etc.) from staining the counter. A damp cloth is all that is needed for cleaning these durable surfaces. Hot pots and pans should not be placed directly on the counter, either, as it may crack the glass. Many homeowners who once saw themselves with granite or engineered quartz are now turning enthusiastically to recycled glass countertops, instead. Once you see them, it sticks with you. It’s attractive, trendy, and leaves you with a clean conscience. The price for recycled glass is often around that of engineered stone, too, so you won’t have to pay more to get that feel-good sensation. 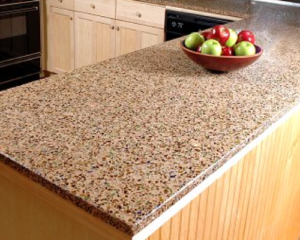 If recycled glass countertops are made with cement, they may require sealing. However, many products, like those carried by RJS Stonetops, are much easier to maintain due to being composed differently. Certain recycled glass products are mixed with 5% resin polymer, which makes it non-porous and therefore sealing-free. This is a sturdy, trustworthy material for commercial kitchen use. Many customers are now turning to recycled glass countertops in Vancouver. It’s becoming an increasingly popular choice – with good reason. Recycled glass surfaces are aesthetically pleasing, practical, reliable, and better for the environment. 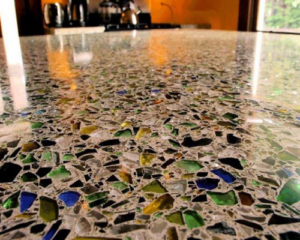 Recycled glass surfaces are being used by many homeowners in both the kitchen and the bathroom. Once you go glass, you’ll never go back.